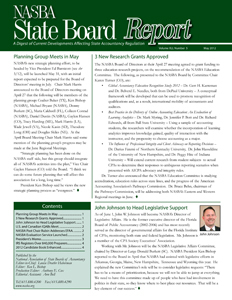 NASBA's new strategic planning effort, to be headed by Vice President Ed Barnicott (see sbr 3/12), will be launched May 31, with an initial report expected to be prepared for the Board of Directors' meeting in July. Chair Mark Harris announced to the Board of Directors meeting on April 27 that the following will be members of the planning group: Coalter Baker (TX), Ken Bishop (NASBA), Michael Bryant (NASBA), Donny Burkett (SC), Maria Caldwell (FL), Colleen Conrad (NASBA), Daniel Dustin (NASBA), Gaylen Hansen (CO), Tracy Harding (ME), Mark Harris (LA), Wade Jewell (VA), Nicole Kasin (SD), Theodore Long (OH) and Douglas Skiles (NE). At the April Board Meeting Chair Mark Harris said some mention of the planning group's progress may be made at the June Regional Meetings. "Strategic planning has been done on the NASBA staff side, but this group should integrate all of NASBA's activities into the plan," Vice Chair Gaylen Hansen (CO) told the Board. "I think we can do some future planning that will affect this association for a long, long time." President Ken Bishop said he views the new strategic planning process as "evergreen."